Nothing compares to time well-spent in a beautiful location like Mexico. White-sand beaches, delicious food, and memorable experiences make it an appealing beach vacation destination for every type of traveler. 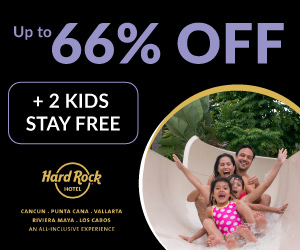 A beach vacation at Hard Rock Hotel Cancun is a unique, star-like experience for guests of all ages. Each room or suite features a private balcony, hydro spa tub, and other upscale amenities for ultimate relaxation after a day at the beach or pool. Six gourmet restaurants serve meals prepared with flavor and created to satisfy every craving. You can also enjoy top-shelf beverages outside in the tropical sunshine or at one of the stylish indoor bars. Guests of all ages will lose track of time with the whirlwind of entertainment provided right within the resort grounds. The Hard Rock Roxity Kids Club™ invites younger guests to socialize and participate in themed activities. Splash around at a pool party, put on your pirate hat and embark on a thrilling treasure hunt, build a sandcastle on the beach, and more. If you’ve ever wanted to know what it’s like to DJ, play in a band, or record music, visit the Music Lab and show off your skills. Jump into the freestyle pool to cool off, join others for a riveting sports game, or break a sweat at the gym. Golf lovers will appreciate unlimited tee times at different courses in Cancun included with their stay. Offsite excursions and spa treatments come at their own additional cost, but are worth adding to your fabulous beach vacation! 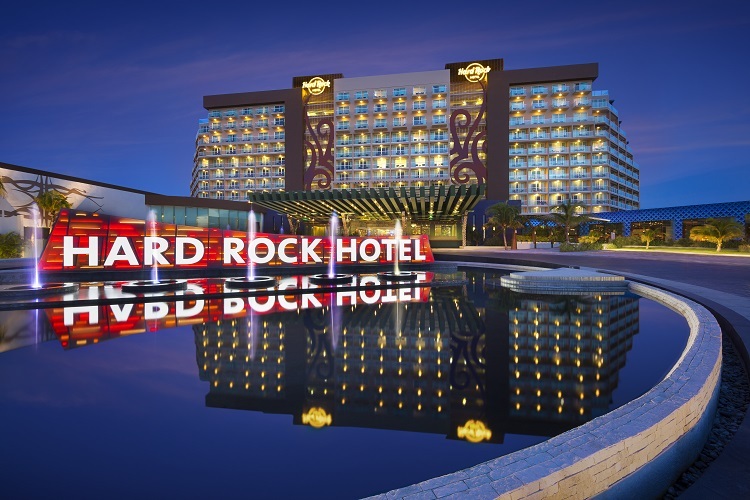 Book and SAVE on your vacation: Hard Rock Hotel Cancun packages are available at All Inclusive Outlet. A retreat to UNICO 20°87° is something you didn’t know you needed…until you’re there! 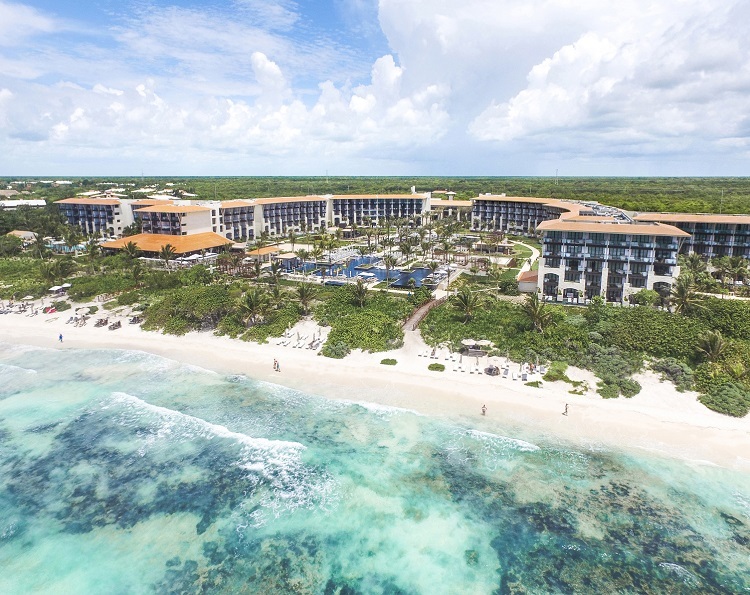 This adults-only resort in Riviera Maya opened in 2017 and sits on a gorgeous white-sand beach facing the Caribbean Sea. 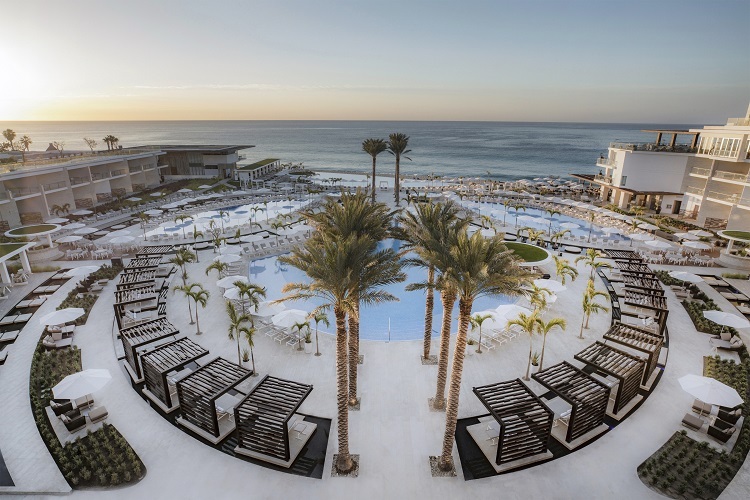 Its focus is to deliver an experience that you can’t find anywhere else; one that fuses the culture of Mexico with modern comfort and high-end luxury. You’ll have an oasis to call your own in a lavish room or suite. An in-room mini bar, local host service, aromatherapy, terrace with lounging area, and much more keep you comfortable throughout your stay. Guests will have plenty of opportunities to get their share of sun and sea. As part of their all inclusive package, UNICO 20°87° offers unlimited inclusions. You’ll have access to sports, activities, and local excursions for just a small service fee rather than paying full price like most resorts ask for. So make the most of this perk, whether it’s through paddle boarding, golf, scuba diving, a guided tour of the Mayan ruins, and more! Book and SAVE on your vacation: UNICO 20°87° packages are available at All Inclusive Outlet. Everything you could want in a beach vacation is found at the family-friendly Dreams Riviera Cancun Resort & Spa! Their Unlimited-Luxury® experience is designed to spoil every guest. Spend lazy days by the pool or on the beach as the friendly wait staff brings you your drink of choice. Participate in rousing sports games and water activities or take a class such as cooking to learn new skills. The Explorer’s Club for Kids features crafts, campouts, games, and more for young ones ages 3-12. In the evenings, themed parties, movies, and live entertainment guarantee a good time for all. Resort accommodations are impressive and luxurious. Settle into relaxation from your private, furnished balcony or terrace. Spend an evening in with 24-hour room service and a whirlpool bathtub. 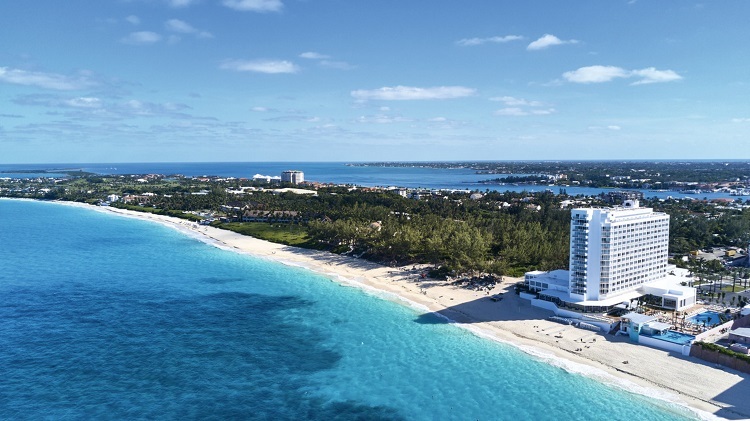 Preferred Club members are treated to additional amenities like an upgraded suite, special concierge service, private lounge and beach areas, and more to enhance their stay. Unlimited-Luxury® at Dreams Riviera Cancun also means you’ll taste an array of flavors through mouthwatering meals and delicious bites. Find coffee and snacks at the café for a quick pick-me-up. If your appetite calls for more than one serving, hit the buffet. Six a la carte restaurants serve seafood, grilled favorites, and international cuisines to feed your hunger without a reservation. Top things off with a beverage from any of the resort’s bars and lounges as you celebrate your time in paradise. 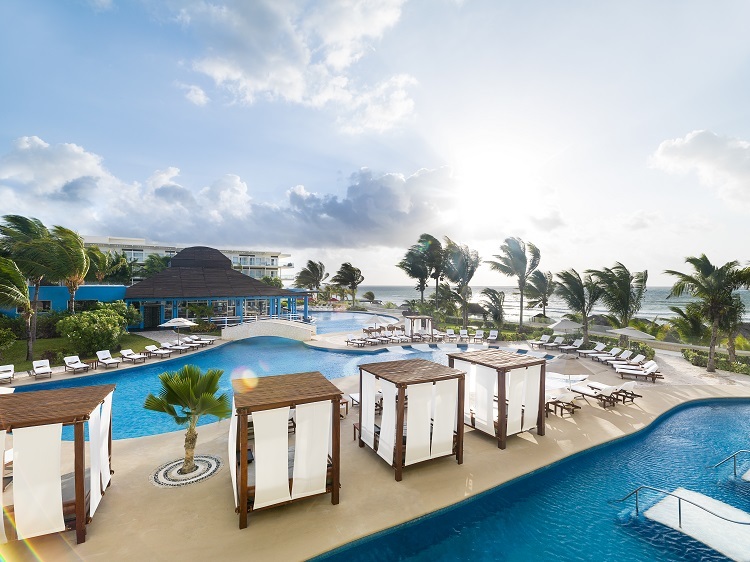 Book now and SAVE on your vacation: Dreams Riviera Cancun Resort & Spa packages are available at All Inclusive Outlet. 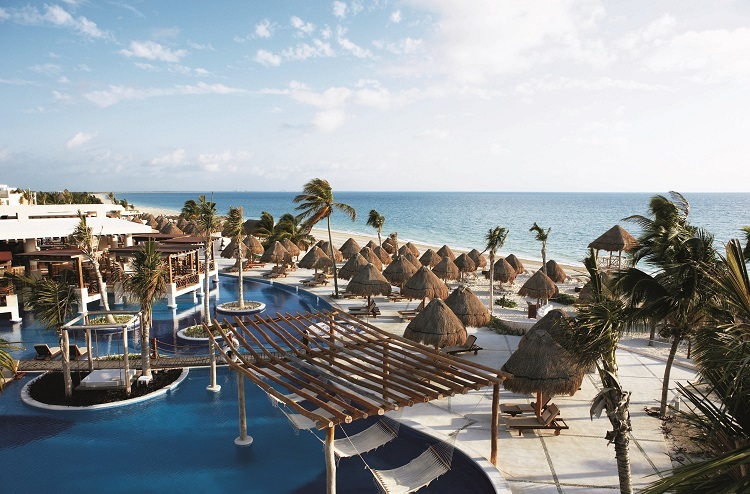 The shores of Riviera Maya invite you to the adults-only El Dorado Royale for a peaceful getaway. Beautifully furnished suites are sanctuaries of privacy and luxury. Quiet moments can be enjoyed out on your balcony or terrace or in your Jacuzzi. If you wish, you can choose a swim-up suite with easy access to the main pool for added convenience. Dining at El Dorado Royale is a food lover’s dream come true. Fresh ingredients are sourced from the onsite greenhouse so that every bite is bursting with flavor. Indulge your taste buds with an array of international dishes from Italian and Asian to Mediterranean and Mexican. Pizza and burgers can be found at La Cabana Pizzeria while healthier options such as smoothies, salads, and more are served at the Health Bar and Las Olas. Fuentes-Culinary Theatre features dinner and a show for a memorable evening. And of course, drinks are always flowing at the ten onsite bars, including four swim-up bars, so your favorite beverage is always available. In between meals and downtime in your suite, discover the excitement El Dorado Royale has to offer. Take a leisurely horseback ride around resort property or join other guests for a Mezcal tasting. Runners and fitness enthusiasts will appreciate the option of participating in a 5k run along the beach, which take place every Friday morning. Other sports and activities to keep you moving include beach volleyball, water polo, cooking classes, archery, and more for hours of fun! 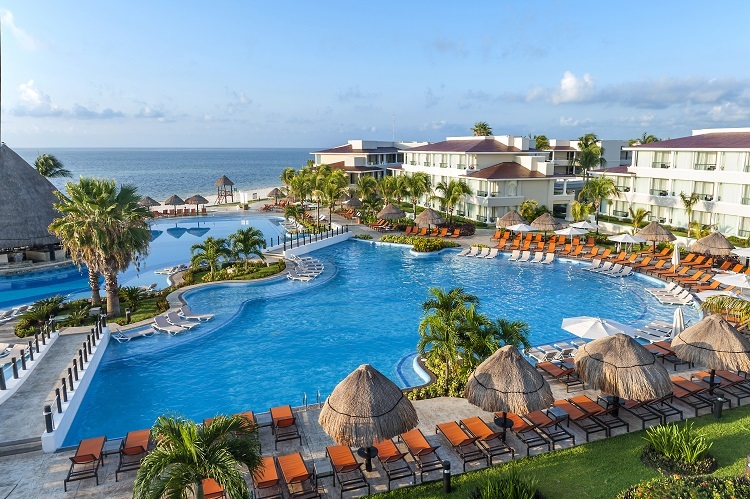 Book and SAVE on your vacation: El Dorado Royale packages are available at All Inclusive Outlet. 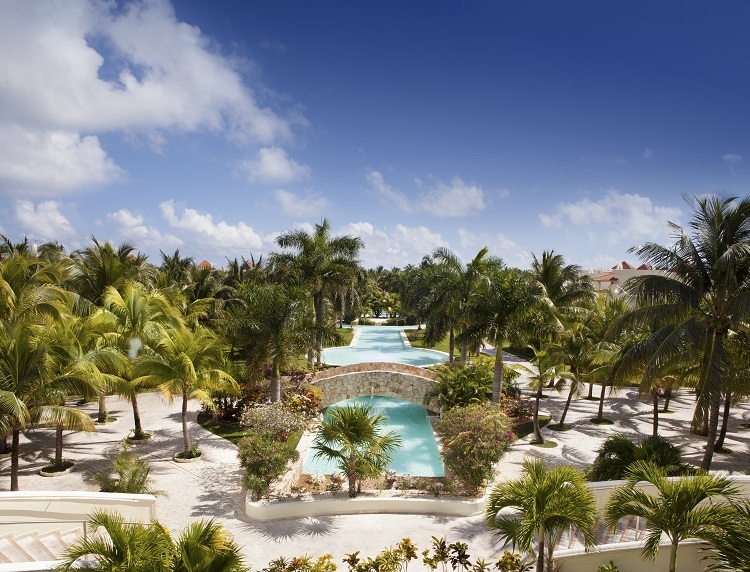 Island vibes create a laid-back, tranquil atmosphere at Moon Palace Cancun. Travelers of all ages will appreciate a lavish experience where each day is better than the last. Suites offer stunning panoramic views plus in-room whirlpool tubs, spacious seating areas, minibars, and more to give you an at-home feel so you’re always relaxed. Continue to feel relaxed down by the pool as you soak up some vitamin D. When adventure starts calling, grab your snorkel gear and explore beneath the surface, catch a wave on the FlowRider® Double Wave Simulator, or take a bike ride around resort property. Designated playrooms are open to children ages 4-12 and the Wired Lounge welcomes teens into a hip atmosphere with an arcade, video games, and snack bar. Mayan temple tours, dolphin swims, and other offsite adventures make long-lasting memories for everyone. When the sun goes down, a lively club and eye-popping performances keep the celebration going for hours. Resort dining is perfect for guests who like a variety of tastes. Italian, Mexican, and Asian cuisines are savory down to the last bite. If you prefer to keep things easy, quick bites can be found at lounges and snack bars. Quench your thirst throughout the day and well into the night at the pub, lobby bar, or by the pool. Unwind at Skybar with hookah and your drink of choice or stop by Los Columpios Bar for a cocktail as you sway on a swing set. There isn’t a craving Moon Palace Cancun can’t satisfy! Book now and SAVE on your vacation: Moon Palace Cancun packages are available at All Inclusive Outlet. Your vacation time is precious and Azul Beach Resort Riviera Cancun makes sure every minute is worthwhile. The Nickelodeon Experience is a one-of-a-kind program for kids to learn and play through character meet and greets, games, crafts, and more. Teens between the ages of 13 and 17 can watch movies and music videos, compete with others in pool or air hockey, and play video games at Extreme Breeze Teens. 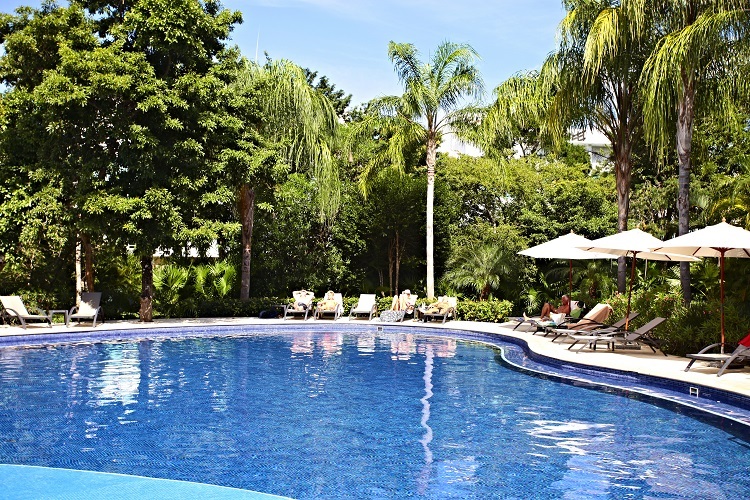 Pool volleyball, kayaking, and tennis are just a few of the activities available to all guests, and Vassa Spa caters to both children and adults looking to be pampered. Bright, spacious accommodations are fit for groups of all ages and sizes. Whether you need one bedroom, connecting family rooms, or just want the convenience of direct access to the swim-up pool, there are plenty of options. 24-hour room service and a daily stocked mini bar will come in handy if you ever just want a quiet night in. For parents traveling with babies, cribs, baby monitors, bottle warmers, and more are included with your stay. Restaurants at Azul Beach Resort Riviera Cancun make mealtime a delight. Plates teeming with flavor are as mouthwatering as they are filling. Dig into authentic Mexican dishes, Spanish cuisine, Italian favorites, and more. And don’t forget to visit any of the resort’s bars or lounges where premium beverages are served to your liking. 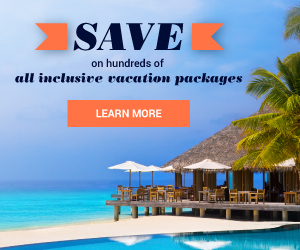 Book and SAVE on your vacation: Azul Beach Resort Riviera Cancun packages are available at All Inclusive Outlet. There’s a time and a place for adults to have their own fun and it’s on a beach vacation to Breathless Cabo San Lucas Resort & Spa! The shores of Medano Beach are the perfect spot for groups of friends, couples, and even singles to take a break from their daily routines. Indulge in limitless food options like an international buffet, Italian cuisine, Eastern Mediterranean entrees, and more. Make new connections over a refreshing beverage at the pool bar, lobby bar, or stunning rooftop lounge. Every atmosphere radiates good vibes for all guests to be at ease and savor their vacation experience. Plan mornings, afternoons, and evenings however you like with a multitude of activities and entertainment. Take to the open water on a paddle board, join a game of beach volleyball, or sign up for a mixology class; the opportunities are endless! Live music and themed events keep the party going throughout the day and well into the night. Once it’s time to reset, your gorgeous suite features all the bells and whistles essential in making you feel as comfortable and pampered as possible. At Excellence Playa Mujeres, luxury is a way of life. Located just north of Cancun, guests of this adults-only resort will always feel at ease among calm blue waters and lush greenery. Your suite is your temporary home away from home. A flat-screen TV, sectional sofa, Jacuzzi, in-room liquor and wine, and much more provide the comforts and conveniences needed to always feel relaxed. If you’re a member of the Excellence Club, additional perks such as private check-in and check-out, sparkling wine upon arrival, upgraded in-room liquor and wine selection, private beach and pool area, and more enhance your experience for premium luxury and service. Join other guests around the resort for leisurely activities and nonstop fun. Begin your mornings with a yoga or Pilates class before stretching out next to the pool. Check out the competition in a game of water polo or play some beach football under the tropical sun. 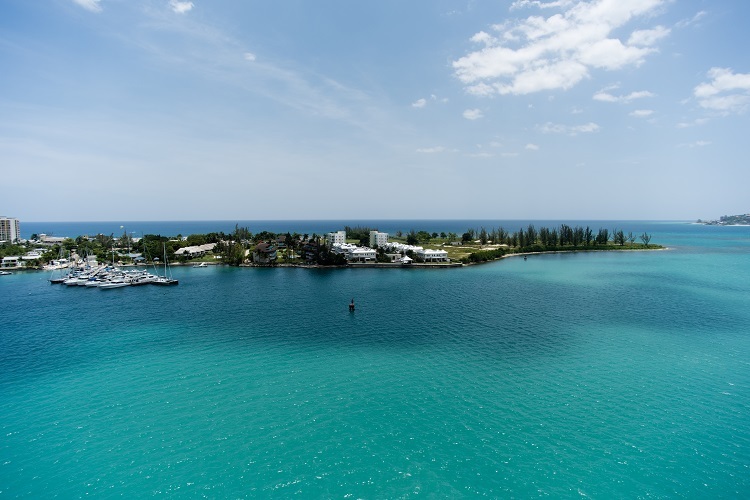 Additional activities like golf, deep-water shipwreck dives, tastings, and more come at an extra cost, but will make your stay that much better. Performing acts and the sounds of paradise light up each night with captivating energy before you retreat to your room. Fine dining at Excellence Playa Mujeres doesn’t disappoint. Whether you’re in the mood for something as simple as a wood-oven pizza or crave the exciting spices of Indian cuisine, there’s an option for everyone. All restaurants even offer vegetarian menus. You’ll also enjoy coffee and espresso, fruity cocktails, wine, and more in a variety of atmospheres to suit your vibe. Book and SAVE on your vacation: Excellence Playa Mujeres packages are available All Inclusive Outlet. 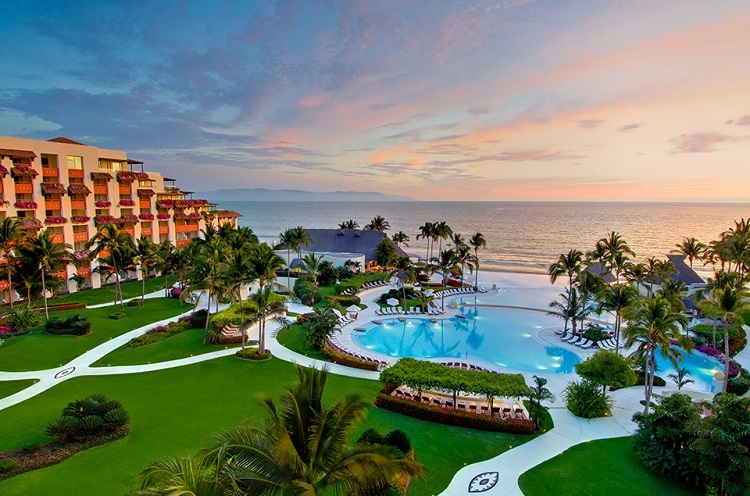 Grand Velas Riviera Nayarit sits on the coast of Puerto Vallarta where guests of all ages can let go and relish the west coast Mexico scenery. Look out onto picturesque views from your suite where you can retreat at any time for privacy and relaxation. Wellness suites give your mind and body the care they deserve with a wellness menu, aromatherapy, exercise kit, and more. Take your pick from six elegant restaurants for all of your meals. Feel the warm tropical breeze at Selva del Mar or Azul. Piaf, Lucca, Frida, and Sen Lin are set within elegant environments where world-class cuisine is savored. Alcoholic and non-alcoholic beverages can be enjoyed at the swim-up bar. Koi Sports bar is for adults 18 and older to spend relaxing evenings with a drink in hand. There’s plenty to do for everyone staying at Grand Velas Riviera Nayarit. Kids ages 4-12 can play for hours at the Kids’ Club and teens ages 13-18 will appreciate the hip Teens’ Club for social events. Additional non-motorized sports and recreational activities are available every day. The nearby lively city of Puerto Vallarta welcomes visitors to admire its charming sites and unique culture. 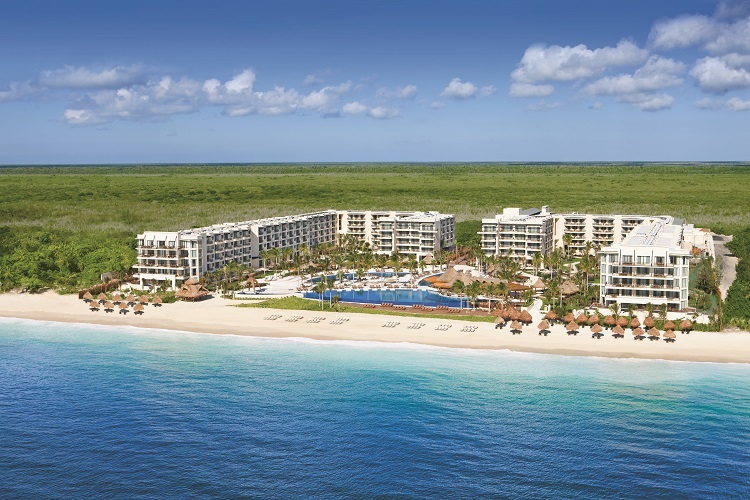 Book and SAVE on your vacation: Grand Velas Riviera Nayarit packages are available at All Inclusive Outlet. 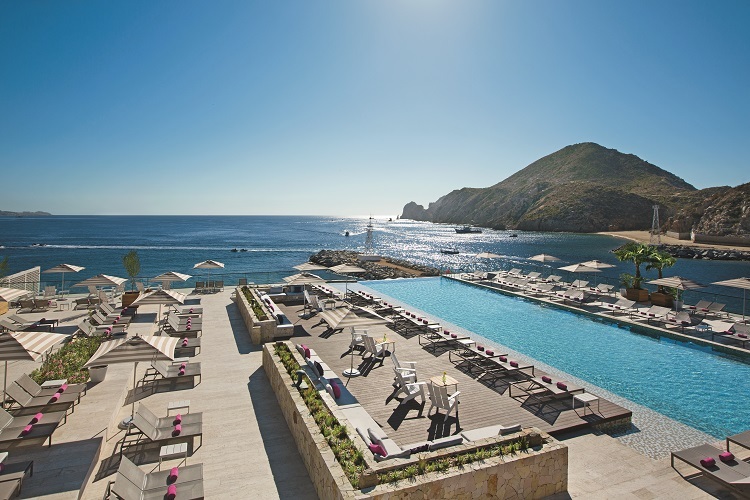 Recharge and reconnect at the newly-opened adults-only Le Blanc Spa Resort Los Cabos. Escape to a bright, open suite and enjoy luxuries such as nightly turn down service, liquor cabinet, in-room aromatherapy and pillow menu, to name a few. When you’re hungry, head to one of the resort’s restaurants for gourmet French fare, seafood, Pan-Asian plates, and other appetizing meal options. Start your day with a fresh cup of coffee or satisfy your sweet tooth at Blanc Café. A trendy bar lounge and the sophisticated lobby bar are ideal spots to sip on your favorite drink and mingle with other guests. Create lasting memories when you explore Cabo San Lucas, Mexico. Take a romantic boat ride at sunset, embark on a snorkeling adventure, swim with dolphins, or get a taste of the local culture by walking through the historical San Jose del Cabo or exploring the vibrant Todo Santos. If you prefer to stick close to resort grounds, make your way to the world class spa for a rejuvenating hydrotherapy journey. Visit the fitness center for a list of classes and workouts, and then gaze out onto the beach from one of four spacious swimming pools. Whatever you choose, you’ll have the time of your life doing it! 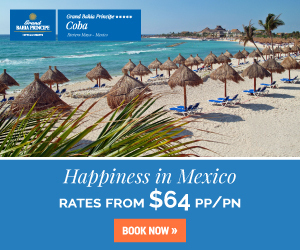 You can’t go wrong with any of these Mexico resort packages; it just depends on your vacation needs! For unbeatable discounted rates, visit All Inclusive Outlet and start planning your picture-perfect beach getaway today.